I am so excited to announce today's give-away offering you the chance to win a luxury 16 piece Grand Prix cutlery set from Danish design firm Kay Bojesen worth 325 euros! The stainless steel flatware set includes 4 dinner knives, 4 dinner forks, 4 dinner spoons and 4 tea spoons. Grand Prix cutlery is know as the national cutlery of Denmark and was crafted by the world renown Kay Bojesen who trained as a silversmith in Copenhagen. The luxury stainless steel flatware cutlery set follows the Bojesen craft philosophy: perfect form without compromising functionality. As a result, Kay Bojesen won the Grand Prix at the world exhibition in Milan in 1951. And this set could be yours just in time for Christmas! 1. Visit the Kay Bojesen website. 2. Choose your favourite item from the complete Grand Prix selection here. 3. In the comment section below briefly state which item you like best from the complete Grand Prix cutlery selection and why. This give-away is open to everyone! Be sure to enter latest Sunday 9th December and please don't forget to leave a way for me to contact you. The winner will be announced on Monday 10th December through My Scandinavian Home blog, Twitter and Facebook. I love, love the gravy spoon. What beautiful, thoughtful design. And the perfect utensil to add to my home for the holidays. I kind of love the ice cream spoon, long enough to eat ice cream without getting your fingers all sticky and I love the cake server, you can never have too many especially around the holidays. I like the latte spoon because sometimes a long-handled spoon can come in very handy for multiple uses. I love the jam spoon for its beautiful shape and because it reminds me of summer locked in a jar that you can taste to warm up in winter. Min favorit är 'Dessert spoon small'. För att jag gillar dessert. Och för att om man har en liten sked så räcker desserten längre. Och dessutom så kan hushållets små händer använda skedarna även när det inte vankas dessert!! I like the cake server because of its minimalistic design tht still succeeds to be unique and stand out. being an ice cream lover, I'm drawn to the ice cream spoon....beautiful classic design. The cake server is great. I love its design, round, simple but stylish. This is a really great giveaway! I'd always wanted the Grand Prix set, because it's so timeless! It would decorate my christmas table - or perhaps it would be a quite nice gift for myself or my sister this Christmas. My favourite item from the set is the dinner fork, because it's so classy! Hi! Quite nice giveaway! I've begun to collect all of this "necessary" stuff - plates, glasses, blender, kitchen weight and so on - because I'm moving out from my parents because of studies and I would really appreciate to eat from good-looking cutlery, when I can't eat with my family any longer ;) I think the lunch fork is my favourite item, because it's so minimalistic though it's still elegant. My favourite is the jam spoon. Up until now I didn't even know such a spoon existed, but all of a sudden I feel a need to serve my jam with a spoon purposed to do just that. I also imagine it will work perfectly serving Nutella. All of the cutlery is beautiful, but I like the toddy spoon best, it's pretty to look at and I can imagine using it for all kinds of purposes. The cake server -- such beautiful simplicity, oh my! Thanks for that contest! the value of this price is amazing! So many beautiful stuff on the site! I love the serving spoon, the lines, the size of it and the richness of the metal looks amazing! My favourite is the Handle Spoon - it's just so cute! What a fabulous giveaway! I love the round shape of the soup spoon-- simple and elegant. I love the jam spoon! I always use a knife for jam, and it is not very handy! I also love the philosophy of the arts and craft movement: beauty and functionality! I love the rounded shape of the soup spoon best, though it's all very clean lined and elegant. I love, love the cake fork! So elegant and dainty for something I would use at tea parties to shovel delicious pastries and cake into my mouth! Couldn't be any more perfect. Love the shape of the cake server and the matte finish on the entire set. I absolutely love this cutlery set! It's similar to what I grew up with (a very modern Dansk pattern), but to me it has a bit more flair. I love the matte finish and the very simple handles and oddly enough, I especially like the curve of the knife. That has to be my favorite piece as it makes the piece ever so slightly whimsical, but not too much so. I'm a relatively recent reader of your blog and I have to say I love it! Now, if I could only move to Sweden! The subtle curved design of the entire set is wonderful, but I love the toddy spoon especially. I drink a lot of coffee, so a spoon specifically designed for the purpose would be well-loved. Wow, thanks for showing it here. Will definitely put it on my wishlist. The item I like best is the Ice cream spoon: I recently bought an ice cream maker and am now in need of proper spoons. These I like! I LOVE the jam spoon. That rounded shape. . . . I just want to eat a big spoonful of blackberry jam now. Niki thank you for the great giveaway! I'm really keen on the toddy spoon. I have always liked to use a tall spoon so my hands could stay clean from honey or jam. My favorite would be the fish knife. Not that I'm keen fish eater, but I just love the shape. I'm with the toddy spoon too, purely because it's a toddy spoon, hell yeah! My favorite by far is the dinner fork. It's perfect in its prolonging shape and would probalbly be a delight to use. The evidence that perfect design AND functionality can be combined. My favorite item is the polished steel latte spoon ! I would need one to get all the milk foam remaining at the bottom of my beautiful and design Bodum cup :) This would make my latte perfect. Living with three males has taught me that cutlery that feels nice in my small lady fingers can feel too fiddly to a large male. This cutlery looks substantial as well as beautiful. Oh, and I really like the Gravy spoon; pretty. What a magnificent giveaway! My favourite would have to be the serving pieces(as a set) but if I HAD to go with only one, the serving spoon. Gorgeous. This set is lovely!To choose one it would be the lunch fork. Forks are usually the item that puts me off an otherwise lovely set of cutlery. This one has lovely symmetry in the way the prongs form a soft tapering shape life the handle. The prongs are a nice length too- too often forks seem to be designed as tonsil prodders with such long prongs! I love the ice cream spoon too since to need a handle that long it assumes that your bowl of ice-cream must be huge (just as it should be). Congrats to whoever wins this set- it truly is lovely. The children's cutlery set as a love of superb Danish design can never start too early! Mmm, it is gorgeous, but my favourite is the toddy spoon as it conjures up all sorts of delicious hot drinks, especially dreamy with this very cold weather we're having. What fab stuff I love the Latte spoon. These are all such beautiful items. Cutlery is so often taken for granted but can add so much to the enjoyment of a meal. My favourite item is the 'pusher' to go with the handle spoon. My 2 year-old is refining her cutlery skills and this is an ingenious design. It would also be wonderful for our cutlery to match as a family. Love the GRAND PRIX child's set, very beautiful clean design and very functional. Especially the fork, great design! Ok. We´re moving this month our very own first home, but some things are still missing from the kitchen (like knifes and forks). So, I found your cool blog (thank good!! )And then...I saw this fabulous cutlery set. Right away I showed it to my husband and told him: "Look, what a great, elegant, super cool cutlery set and it`s all pure design!" He looked at me and said: " Are you out of your mind? It`s just knifes and forks and spoons. They look very simple, nothing more." I was furious. And I said my last words. " You do not know anything about design! look, there is even a salt spoon and the pusher!" "What is the pusher?" :D:D And I said: "This is the coolest design product at all, which ever invented." Believe me, I know that, we have 2 little children. Oh wow...beautiful cutlery...love it all! Especially the jam spoon...thanks for the opportunity. i like the knife, just like the way it curves. I really love the ice cream spoon. It's not just because of its perfect design but also because the thing I like eating most (and I do love eating) is ice cream. My dreamt present had always been an ice cream maker, and finally my boyfriend gave it to me for Christmas. We've recently bought a house, but we can't afford everything at first, and we don't have cutlery yet. I'm looking for the perfect set, and now I think I have found it at last. It'd be incredible for us to win it, as everything and every day is so important now, because you only have a first home once in your life. Thanks for such a lovely giveaway! It's hard to choose a favourite but I really like the gravy spoon - it's such an elegant and functional design. Lovely rounded soup spoon! Perfectly balanced. Simply beautiful. It is my e-mail (m.lisiak@op.pl). Alright I might sound like one of the herd but that jam spoon is adorable. Overall the set is simple, elegant, functional and beautiful. The thing about the jam spoon is the sweet indulgence of a spoon designated for one function. My aunt lives in a tiny village in Nova Scotia. Every Thursday she has Biscuit Night. She serves biscuits and tea to anyone who wishes to show up. Big fluffy warm biscuits with butter and homemade jam. Strawberry, raspberry, blueberry and gooseberry. The idea of a jam spoon takes me right back there. Thanks for the contest but most of all thanks for the wonderful peek into Swedish design. I am addicted! I like the cake server. I love the shape of the salt spoon. The cake server is beautiful. I love the dinner spoon: http://www.kaybojesen.dk/en/products/middag/middagsske. ... love the salt spoon! My favorite would be the Latte spoon, it's so elegant. My favorite: The fish knife! I love the soup spoon. As soon as the weather turns colder I start making at least one batch of soup a week-it is so comforting! 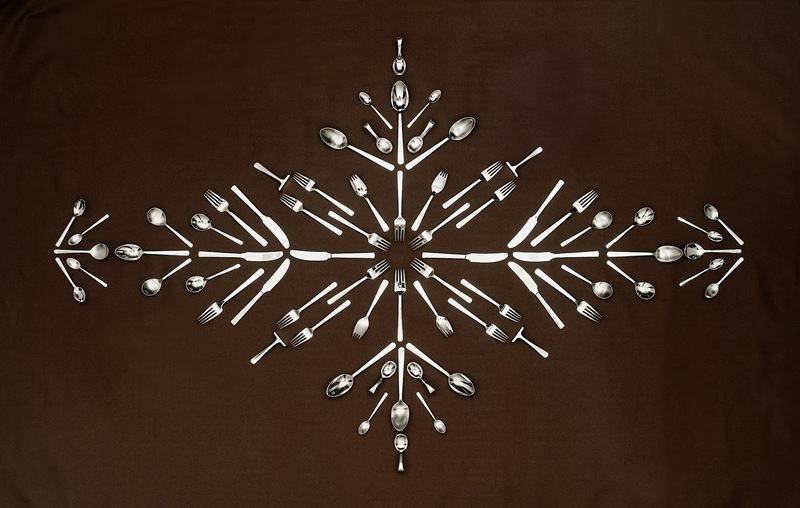 I don't, however, have any soup spoons, so this would be a great addition to my flatware! oooh definitely the cake server, i've always wanted a beautiful one to serve my desserts with. 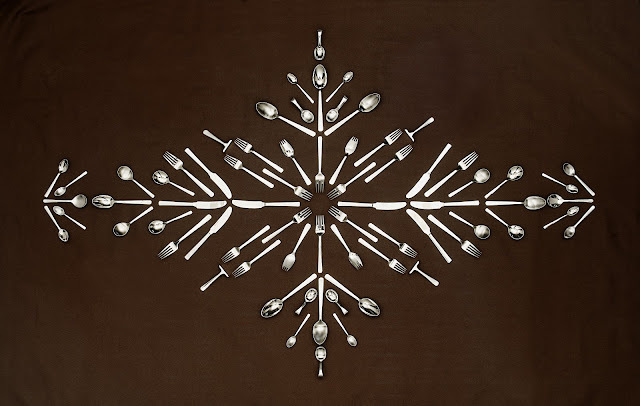 What beautiful sleek, elegantly made cutlery and what an absolutely wonderful giveaway just in time for Christmas! So hard to choose finally it came down between the gravy spoon and the ice cream spoon. The gravy is my winner because it can be used for sauces, creams and drizzling for that perfect designer look. Being english, my favourite piece has to be the tea spoon! To make the perfect cup of tea you have to have a perfect spoon to hand, when I last checked our drawer there were 4 different types of tea spoon, none matching and none perfect and certainly not as sleek and stylish as these! Great blog as always niki and thanks for sharing this great competition with us. really lovely, classy and timeless with a bid of kitsch. what a lovely addition for any home. We should all be allowed to eat with a spoon fork - the perfect combination of fork, spoon and pusher which makes any meal a joy to eat. I love this spoon fork! Love the toddy spoon! Anything that helps stir the sugar on the bottom... so perfect. I like the child's knife, it encourages children to enjoy dinner: its curved blade without teeth looks like a smile. I can't decide whether my favourite piece is the matte steel gravy spoon or the matte steel fish knife. But hey, every piece is beautifully crafted so they are all favourites!! The fish forks are fabulous! I have never had a fish fork, so they are definitely my favourite. caroline.elvy@sky.com. I like the salad server. The design reminds me of a tulip flower, simple and stylish. Ooooh! The soup ladle is perfect! Elegant and versatile it's design, would go well with all of my china. Woow what a Price..... there are really many items to Choose from. But I know what my favorit are.. The Fish Knife..... Today the experts sats That we have to eat Fish once or twice a week because It's very healthy. And When you are parrents you try Too follow That advice, to give your children the Best nutrition. We are a normal famile with a indcome under the normal Line, we Don't have the indcome to buy a special type of knife. The are one knife, thats it. With That Said, we actually sommetider Think , we need a Fish knife, bevares the edge ón ours are round, as Many are. We luften actually need Fish knife and fork. the sharpe edges makes it a whole lot easyer and you Can remove the bones. I Think many people prefers other kinds of meat because they Think It's to difficult with all the bones, and Thats why It's not so popular. I really love the soup spoon. Dedicated cutlery for enjoying soup, such extravagant pampering. I love it! So many nice things! The jam spoon has a cute rounded shape and the set for kids is lovely, well, everything so elegant! The beautiful cake server really stands out, I love it!! I love the gravy spoon! It would be a beautiful addition on the Christmas table.